Welcome to Forest Cover No. 49, the Global Forest Coalition newsletter that provides a space for Southern and Northern environmental justice activists to present their views on international forest-related policies. Feature: Intensification of Agriculture and Livestock Production: Climate-Smart? Agriculture, including livestock farming, is increasingly becoming a battleground, with land, farming and food production being wrested away from peasant farmers by agribusiness exporters and their financial backers. This trend is being condoned and even driven by intergovernmental negotiations in various different fora, and now dominates climate change negotiations as well as trade talks. Two significant Ministerials impacting on livestock and agriculture (one way or another) took place in the last few weeks of 2015. First, the 21st session of the Conference of Parties to the United Nations Framework Convention on Climate Change (UNFCCC COP 21) in Paris, and second, the 10th Ministerial Conference of the World Trade Organization (WTO) in Nairobi. The Paris COP drew thousands of people onto the streets of France, with millions around the world watching via various media. It had been built up by many as a ‘historic’ moment that would save the planet. The WTO Ministerial, on the other hand, although challenged by farmers’ mobilisations on the streets of Kenya, barely registered a blip in mainstream media or with the general public. On the surface, there seems to be no significant linkage between the two fora. One is tasked with designing and implementing policies that will limit average global temperature increase to 1.5-2oC above pre-industrial levels, in order to avoid runaway climate change. The other is an organisation that deals with the rules of multilateral free trade. However if one delves more deeply, there are many similarities and linkages, especially because changes in the UNFCCC mean that both institutions are now based on the logic of markets. This article focuses in on the impacts that the WTO and UNFCCC have on food and agriculture in particular. In both the trade and climate negotiations, the root of the current commodification problem is that the agricultural sector is being treated as a source of profit rather than food (and as a testing ground for risky and polluting new technologies such as genetically modified crops ). Both trade and climate change negotiations are being used to gain control of the agriculture and food sectors. This is a commodification of nature and is leading to the displacement of peasants, women and communities from their lands and territories. “A mechanism to contribute to the mitigation of greenhouse gas emissions and support sustainable development is hereby established…. The text sounds dull and technical, but it actually establishes a mechanism that allows countries to trade their emissions reductions (see the highlighted text in (c)), which means they can avoid making reductions domestically. What the text does not say is just as important: This may very well include emissions reductions related to new sectors such as land use, agriculture, and water. Some negotiators in the Paris hallways were referring to this as the “Clean Development Mechanism plus”—in other words an expansion of the old Kyoto Protocol flexibility mechanism. This treatment of agriculture as a tradable commodity rather than a source of life-giving food initially took hold in global trade negotiations, with agribusiness wanting more access to markets in other countries. When world trade was conducted under the auspices of the General Agreement on Tariffs and Trade (GATT), agriculture was treated as an exception, and the sector remained largely outside the ‘GATT 1947’. It was only when the Uruguay Round of GATT negotiations finally established the WTO in 1995, that agriculture was included in its entirety. For the first time in history, food and agriculture were going to be treated mainly as a commodity. Specifically with respect to livestock, changes in global trade are generally driven, or intended to be driven, by changes in import quotas, cuts in applied tariffs, and reductions in export subsidies. The situation has been complicated by restrictions imposed to control the transfer of diseases such as mad cow disease however, and other health related trade controls. 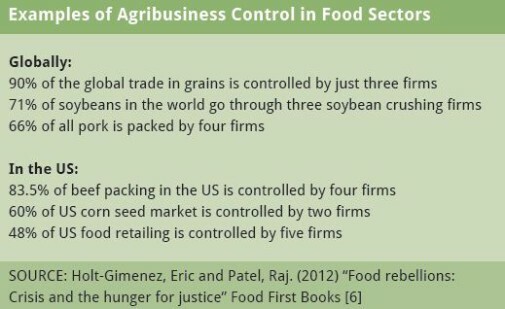 More generally, it is now clear that the WTO has acquired the power to regulate what countries can and cannot do in relation to their food and agricultural policies, and governments have used this to facilitate a corporate take over of the agricultural sector. Agricultural negotiations are especially complex, but overall governments in developed countries, especially the EU and the US, are still channeling billions of dollars of domestic support to their major agribusinesses, while small farmers especially in developing countries, are having to compete with these giant businesses and becoming ever more vulnerable to the volatility of the free market. Although it was originally promised that the Agreement on Agriculture (AoA) would include increased market access for agricultural exports from developing countries, the opposite has happened, with large agribusiness growing even larger and small farmers being wiped out. The most emblematic example of this is that of Mr Lee Kyung Hae, who killed himself by the fence surrounding the WTO Ministerial in Cancun in 2003. He was holding a sign that said ‘WTO kills farmers’. Twenty years later, at the 10th Ministerial in Nairobi in 2015, the original 2013 deadline for ending export subsidies by industrialised countries was extended, to 2018. The promise of a permanent solution to amend the AoA to support countries like India, Indonesia and other small producer countries, remains nothing more than that, an empty promise. However—because of an agreement in the 2013 Bali Package on a ‘peace clause’ on agriculture—countries are not allowed to provide support to their small farmers and poverty stricken constituents through food security programmes. Twenty years after its establishment, the WTO’s rules on agriculture still continue to favour transnational corporations and disadvantage small farmers. Today climate change provides a new entry point for transnational corporations to commodify and control agriculture. Although agriculture is not dealt with explicitly in the UNFCCC’s Paris Agreement on climate change, the text paves the way for new market mechanisms to be opened around agriculture and soils, as explained above. The Global Alliance for Climate Smart Agriculture, an alliance composed of governments, transnational corporations, the World Bank and others, are aggressively pushing for the promotion of so-called Climate Smart Agriculture as the way to address world hunger, adapt crops to extreme weather conditions, and reduce agriculture’s contribution to climate change by using soils as carbon sinks. This is based on what is now being promoted as ‘sustainable intensification’—producing more food on less land, while being climate resilient and absorbing carbon. The new trend for super farms and livestock production in feedlots could be promoted through the concept of ‘sustainable intensification’. However, this approach also favours agribusiness over small farmers, and the creation of carbon markets for soils is being referred to as the ‘brown economy’. Climate Smart Agriculture in this format threatens to drive a new carbon land grab, focused on the territories and lands of peasant and rural communities around the world, with particular impacts on women who are often responsible for subsistence farming. 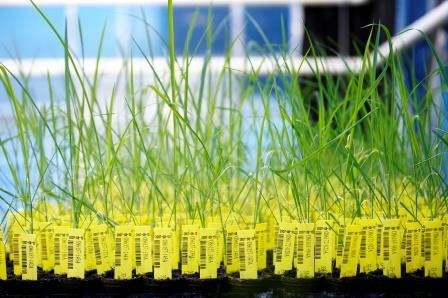 It looks set to trigger increased use of genetically modified (GM) crops designed, in theory, to resist anything from drought to flood. The use of agriculture as a carbon sink rather than as a source of food and life for people means that carbon accounting could become a determining factor when it comes to designing agricultural policy. Climate Smart Agriculture could have significant impacts on our food, affecting decisions such as how and where it is produced, and for whom. The fact that it drives further commodification also means that we are heading towards a future where large transnational agribusinesses might own almost all the land and agriculture, whether plant-based or livestock. As the dust settles after Paris, the media spotlight may no longer be on the UNFCCC and even less so on the WTO, but the battle is far from over. Food and agriculture—all aspects from soil cultivation, protection of biodiversity, preventing deforestation, livestock rearing, growing crops and preserving seeds – is central not only to the lives of peasants, women, small farmers and communities, but to us all. We have the right to food and the right to a healthy climate—and we need to stop transnational corporations and markets interfering with both, through trade rules or the climate regime. We must support the struggle for food sovereignty around the world and renew our way of relating to Mother Nature, supporting peasants’ agroecology and maintaining and promoting small and sustainable livestock rearing. And with that inspiration, we will continue the struggle. Intensification of Agriculture and Livestock Production: Climate-Smart? While the international community praises the Paris Accord as a milestone in humanity’s struggle to reduce greenhouse gas emissions, the reality is that the agreement contains little more than an acknowledgement that climate change is real (nearly two and a half decades after the UN Framework Convention on Climate Change was first signed). Other than that it steadfastly reinforces a business-as-usual scenario, which is still based on unsustainable production and consumption patterns and unlikely to challenge our ever increasing use of fossil fuels. Moreover, the Paris Accord presents unproven, distracting and even dangerous ‘false solutions’—such as geo-engineering, REDD+ and so-called ‘climate-smart agriculture’ (CSA) —as our only options in the fight against climate change. There is of a course a reason for this: These complex business-friendly solutions are focused on creating profit-making opportunities for business, allowing both governments and corporations to be seen to be doing ‘something’ without upsetting the economic apple cart. But—in addition to giving the green light to untested and potentially dangerous technologies—this opens the door to ‘profiteering’ by people and organisations who have little or no interest in combating climate change, and no interest in the welfare of those who might be negatively impacted by market-based projects (including all those being pushed off their traditional lands and losing their livelihoods). The ‘climate-smart agriculture’ model is at the forefront of many intergovernmental negotiations. This is another deceptively named approach that will actually work to maintain business-as-usual, in this case industrial agriculture. Though the Paris Accord does not effectively endorse CSA, most governments participating in the climate change negotiations have been focusing on CSA as one of their preferred options. Yet industrial agriculture has already transformed millions of hectares from lush vegetation, forests, savannahs, wetlands and the biodiversity-rich mosaics of small-scale agriculture, into never-ending monocultures of commodity crops including soybeans, maize, rice, wheat, sugarcane, colza and palm oil. This process is destroying agricultural landscapes that were previously bursting with plant and animal diversity—the pillars of food sovereignty for the peoples of the world. 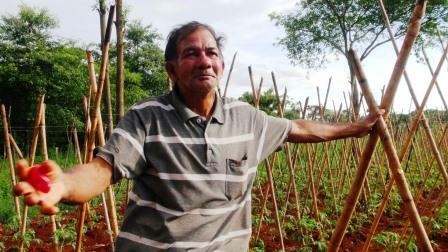 This is so obvious in my country, Paraguay, where almost 50% of the farmers have lost their land in less than two decades, reluctantly giving way to (or being forced to make way for) aggressive agribusiness concerns seeking land for plantations. 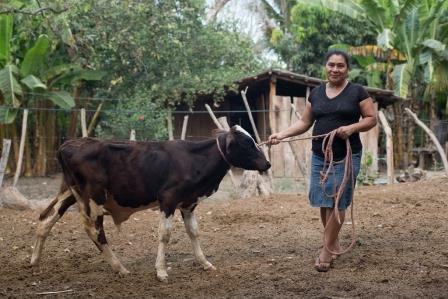 These now cover at least 92% of the land under agricultural production in Paraguay. This in turn has brought about a stunning increase in agrochemical applications—almost 1,000% over the last 20 years! Industrial agriculture has also transformed Argentina, which was, until recently, famed for producing the best meat in the world, which was farmed on almost entirely natural pastures. This country—which so passionately defended a Paris Agreement reference to the need to avoid climate mitigation measures having negative impacts on “food production” (sic)—is now on the brink of importing beef, as 56% of the agricultural land has now been given over to soybean production. As a further consequence of this, much of the beef that is still being produced is now being farmed in cramped feedlots where the objective is simply to fatten the beasts as much as possible in the shortest of times. This comes with stark costs. 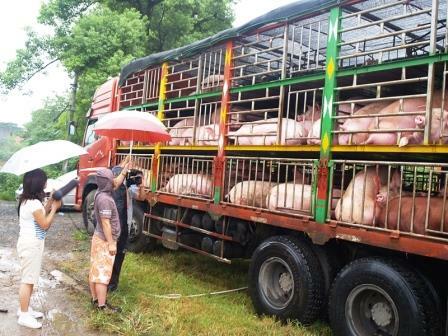 The animals suffer unspeakable torments, tortures and vexations. The environmental impacts are appalling as well, ranging from the contamination of surface and ground waters with residues of chemicals, including antibiotics, and the infestation of the air with polluted dust and flies, making the neighbouring communities’ lives unbearable! These changes add significantly to the existing socioeconomic transformations that are already turning the lives of rural populations upside down. Perhaps the most critical aspect is impacts on public health. 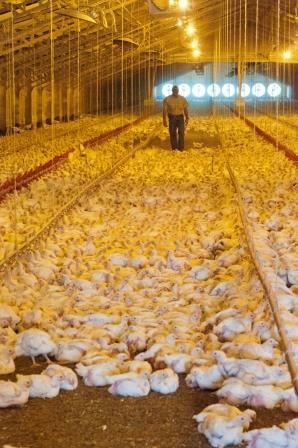 The factory farming of various different species, especially in these so-called Concentrated Animal Feeding Operations (CAFOs), is causing local people to inadvertently ingest extreme doses of pesticide, and consumers in general to ingest yet more chemicals, including steroid hormones and antibiotics. This intensive farming system has also created new strains of bacteria that are resistant to antibiotics, rendering antibiotic treatments ineffective (including for human health). This is creating one of the most dangerous public health threats to humanity to date! Furthermore, the Paris Accord is not an isolated example of the corporate co-optation of the United Nations. There is a push to promote business-friendly solutions across the board. Corporations, with the support of Northern governments in particular, have a clear agenda focused on dominating and maintaining an iron grip on the food ‘business’, especially now that food is becoming such a strategic commodity in light of the threats of climate change. For example in the draft High Level Expert Report on livestock production prepared for the UN’s Committee on Food Security , praise is heaped upon the intensive production model of food production as a means of feeding the world, overlooking the fact that traditional food systems, combined with agroecology, offer a more effective, equitable and environmentally friendly way of meeting that ambitious goal. Needless to say, the majority of the ‘experts’ who wrote the report represent Big Meat or its allies. Risk assessment of growth hormones and antimicrobial residues in meat, Sang-Hee Jeong, Daejin Kang, Myung-Woon Lim, Chang Soo Kang and Ha Jung Sung, Toxicol Res. 2010 Dec; 26(4): 301–313. Mia MacDonald, Executive Director, Brighter Green and Treasurer, Green Belt Movement International-U.S.
“Something everyone should know about the COP 21 climate deal: the words ‘fossil fuels’ do not appear. Neither do the words ‘oil’ or ‘coal,'” writer and activist Naomi Klein observed in a much-retweeted Tweet. This is the case despite the focus of the recent Paris climate conference being, like the global climate change discourse, the reduction and rapid elimination of fossil fuels in favour of low- or zero-emission sources of renewable energy. Fossil fuels are not the only important words missing from the Paris Agreement text, which, reached by nearly 200 countries at the UNFCCC COP 21 summit, pledges to keep global temperature increases to less than 2°C above pre-industrial levels and to work toward a more ambitious target, of limiting the overall temperature rise to 1.5°C. But the Agreement largely ignored a crucial fact: what the world eats and how it produces its food are central factors in addressing climate change. 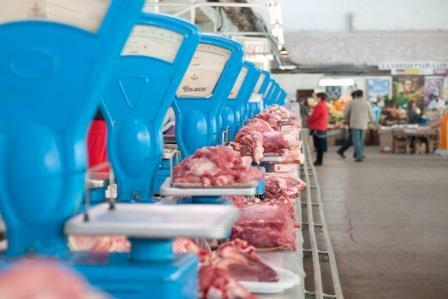 If current trends continue, global meat consumption is expected to rise by 76% by 2050. It will be almost impossible to achieve the targets agreed in Paris without a shift to eating, and producing, less meat, as well other animal products. So, it’s surprising to find this issue not addressed in the Paris Agreement. How could a 31-page document on the fate of the planet and agreed to by 195 countries not mention industrial animal agriculture’s contribution to greenhouse gas emissions even once? No mention of “meat,” “cattle,” “fish,” or “livestock,” either. It’s also worth noting some of the other words that aren’t included in the Paris agreement. There is no mention of “animals” or “other species, and the word “biodiversity” only occurs once. Don’t non-human animals also have a stake in climate change, and a right to livable habitats, breathable air, healthy soils, stable oceans, and intact ecosystems? Partly, these absences reflect the nature of these agreements and how they’re generated. They’re aspirational as much as proscriptive in order to allow countries to feel they have options in how they implement them—and, frankly, to get governments to buy in to them and not be dissuaded from doing so by national interests and lobbies (i.e., in the U.S., as in many other large emitting countries, the fossil fuel industry and agribusiness). This could be read as suggesting that organisations involved in animal protection (wild and domestic), private companies developing plant-based alternatives to meat and dairy products (and investors helping them grow), and others are being invited to put forward proposals for addressing climate change. Is it a strong invitation? Well, it’s probably stronger for businesses than for civil society writ large. But it’s still a way in to the discourse. We shouldn’t forget that. The agreement also recognises the importance of “sustainable lifestyles and sustainable patterns of consumption and production.” This is boilerplate language that’s increasingly common in international environmental agreements and analysis. Nonetheless, it offers an opportunity to argue for the many practical and achievable ways that diets low in or free from animal products reduce or eliminate GHGs at the point of consumption and production—including the fossil fuels and resulting carbon dioxide emissions that most of the delegates in Paris were focused on. “Food” does appear three times in the text, including a call in Article 2 to safeguard “food security” and end hunger, and to recognise the “particular vulnerabilities of food production systems to the adverse impacts of climate change.” This framing alludes to, but doesn’t really capture, the drama, urgency, or hugely destabilising effects global warming is already having on agriculture in the shape of water shortages, erratic rainfall, higher temperatures, and desertification. The text also observes that adaptation measures should not threaten food production. I was told this phrase was inserted into the text by Argentina, one of the world’s top producers and exporters of soy for livestock feed, as well as a significant meat producer. Other leading meat and feed ‘powers’ and big GHG emitters like the U.S., E.U., Canada, Brazil, and China didn’t object. There’s a flipside, however. It can also be argued, with solid data, that intensive animal agriculture itself threatens food production, especially sustainable, equitable, and climate-resilient food systems. This is because of its enormous water, land, and chemical fertiliser requirements, the virtually lifeless monocultures it creates, and the massive water pollution, deforestation, and biodiversity losses it drives. And animal agriculture can’t seriously be described as offering a “low GHG” pathway, given its contribution to GHGs. there and photos are here. Some said as much in Paris, at least outside the formal negotiating rooms. “It’s completely unacceptable that diet and especially the meat question is not figuring prominently on the agenda of the COP,” according to Jo Leinen, a German member of the European Parliament, speaking at an official side event Brighter Green co-sponsored on meat and greenhouse gas emissions at the climate summit , along with Chatham House, Humane Society International, and the EAT Initiative. Most who attended agreed: this should be a matter for public policy, not a fringe concern of the small, but growing, number of the world’s ‘climate vegans’. As my colleagues from Chatham House, who completed a recnet global study on public attitudes toward and awareness of the role of meat in climate change , point out, researchers from Cambridge University have found that a global transition to healthier diets could cut CO2 equivalent emissions by an extra 6 billion tonnes by 2050, nearly all from reduced meat consumption. A focus on dietary change could also lower the costs of climate mitigation by up to 50% by 2050. Clearly, such dietary change must be included in the agenda for future action to combat climate change. To many people, even though they come from different cultural backgrounds, a ‘better life’ is impossible without meat, eggs, and dairy and other animal products—a vision closely linked to lifestyles in industrialised Western countries. So, as living standards improve in emerging economies, rising consumption of animal products is one of the factors fueling the expansion of Western-style, large-scale, intensive animal farming (factory farming) and feed crop monoculture farming. Such practices present considerable challenges for climate change, natural resources, environmental health, public health, farmers’ livelihoods and animal welfare. 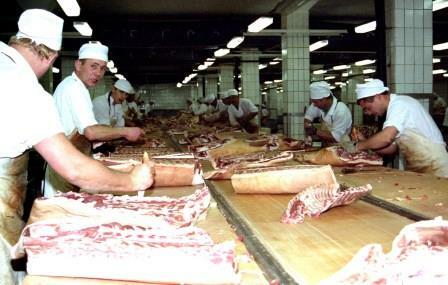 The U.S., China and Brazil are three big and representative players in the global meat and feed sector. They form three points of a triangle: a major exporter of the industrialised meat and dairy production model to the developing world (the U.S.), a rapidly growing economy with a huge appetite for animal products (China), and a country with conflicts between the seeming economic benefits of increasing livestock-related agricultural production and the need to protect some of the most beautiful and ecologically important ecosystems on planet Earth (Brazil). The impacts of expanding factory farming are not, however, restricted to these countries. 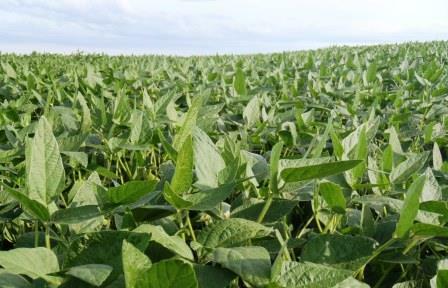 For example, Paraguay, in responding to the growing global demand for animal products and therefore animal feed, has recently emerged as a major soybean producer and exporter. Like its neighbour Brazil, Paraguay is now experiencing the negative impacts of industrialised soybean monocropping. 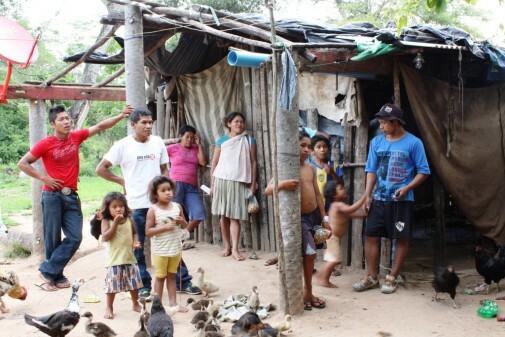 In Paraguay and many other countries in Latin America where soybean fields are encroaching, indigenous communities are being displaced from the forest, which is burned to make space for soybeans. Young lives have been lost to pesticide fumigation in herbicide-resistant soybean fields (as have the peasant communities’ organic crops). Jobs on farms have disappeared as machines have replaced labour. The profits from these soybean plantations has accrued to local elites and multinational companies, further exacerbating social inequality. At the same time, the over-consumption of meat, eggs and dairy products is fueling an epidemic of the ‘diseases of prosperity’, including obesity, Type 2 diabetes and cardiovascular diseases. This is now happening in both developed and developing countries, and these diseases are having a particularly marked impact on low-income consumers. This is due to policies that subsidise the large-scale production of cheap animal products rather than the production of healthy foods. The impacts of over-producing and over-consuming meat are more than just physiological however. Many farmers from Central and South America, who lost their livelihoods to industrial agriculture, ended up working in factory farms or meat processing facilities in the U.S., where their rights are not protected. Long hours of repetitive work, which often involves mutilating, killing, or cutting up animals, is rendering these workers prone to psychological problems that have even increased the crime rate in some communities near factory farms and slaughterhouses. 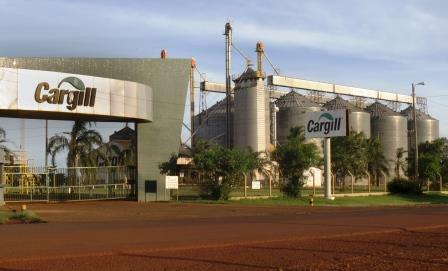 Soybean processing facilities in east Paraguay. In ‘The Triangle: The Evolution and Future of Industrial Animal Agriculture in the U.S., China and Brazil’, a discussion paper released by New York-based public policy action tank Brighter Green, the author briefly summarises the history of industrial animal farming in these three countries, and shows that the global expansion of such system is a natural consequence of capitalist growth and globalisation. But the future is more important than the past. So how should we respond now, to shape that future? In discussions about climate change and other environmental problems, using meat (especially beef) as a protein source has been compared to using coal as an energy source. Similarly, the concept of ‘delegitimising’ fossil fuels has been discussed in the context of curbing fossil fuel consumption—and delegitimising the overconsumption of animal-based foods has the potential to change the current dominant system to a more sustainable one. Groups and individuals are reconsidering the relationship between human beings and animal products, and are standing up and making changes around the globe. For example, from the health perspective, organisations like the Physicians Committee for Responsible Medicine are delegitimising the overconsumption of animal products by revealing their contribution to chronic and acute diseases. 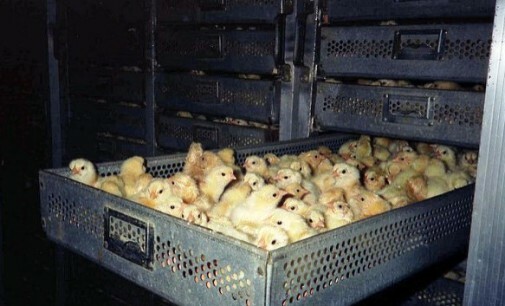 Many animal rights and animal welfare advocate groups are also delegitimising the overconsumption of animal products by bringing the sad truth of animals’ suffering inside factory farms to the attention of compassionate consumers. 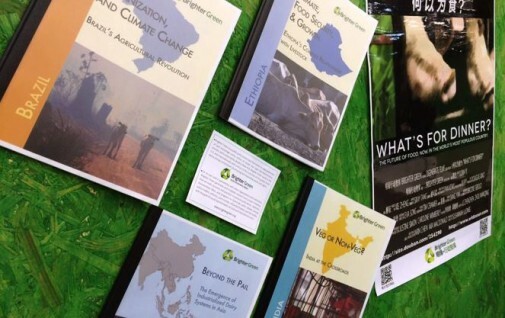 Environmental researchers and activists are delegitimising the over-consumption of animal products by making clear the connection between industrial animal production and deforestation, water pollution, soil erosion and climate chaos. These forces are joining and quickly growing. For such a ‘globalisation from below’ to succeed, however, policy support is also needed. This should include suggested consumption levels, reduced subsidies for the meat and feed sectors, stricter environmental regulations with stronger enforcement, and convincing public education. 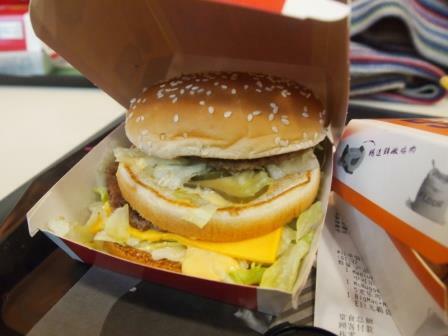 For example, although China is often blamed for its growing meat consumption, the Chinese government has set a target for per capita meat consumption in its nutrition development plan, which is much lower than the country’s current consumption level, and about a quarter of the per capita consumption in the U.S. and Brazil. A policy like this is a step towards a brighter future. Ultimately, a deeper reflection on the multi-functionality of agriculture is necessary to enable every farmer, consumer and policy maker to make sustainable decisions. When animals are seen as more than just a source of protein, and their many roles in a healthy agricultural and ecological system are fully recognised and appreciated, we will be able to make fundamental progress on disassembling the triangle of meat and feed. 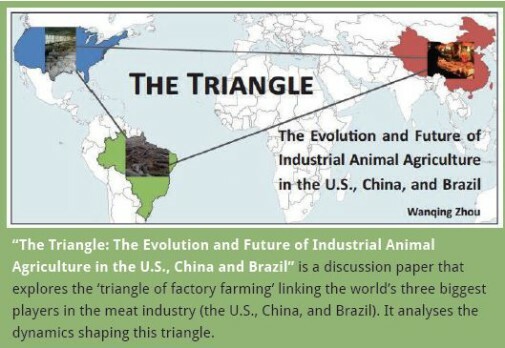 “The Triangle: The Evolution and Future of Industrial Animal Agriculture in the U.S., China and Brazil” is a discussion paper that explores the ‘triangle of factory farming’ linking the world’s three biggest players in the meat industry (the U.S., China, and Brazil). It analyses the dynamics shaping this triangle. Human Consequences of Animal Exploitation: Needs for Redefining Social Welfare, Matsuoka, A. and J. Sorenson, 2013, Journal of Sociology and Social Welfare, 40(4):7-32. 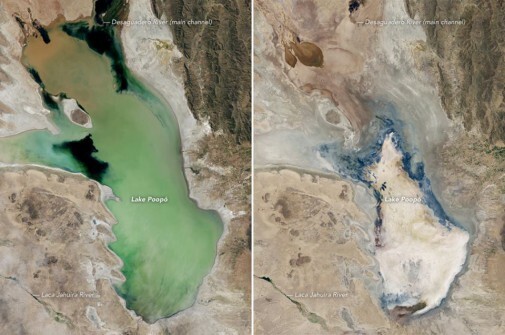 Shockingly, the second largest lake in Bolivia has dried up. The causes of its demise are many and complex, but among them is the rise in temperature and increased frequency of natural disasters like El Niño, caused by climate change. Lake Poopó—previously 2.337 km2 in size with a depth of 2.5 meters—is now a desert with a few puddles in the middle, and these are no more than 30 cm deep. While the average temperature has increased by 0.8°C globally, on Lake Poopó its has increased by 2.5°C. The disappearance of the lake has left behind thousands of dead fish and dead flamingos. Fishing boats are anchored on dry ground, and hundreds of previously independent community members, who have been engaged in fishing for centuries, are now facing a very uncertain future and are in need of support. This is the true face of climate change, which is expanding like a cancer across the world. Will forests face the same fate? It was a great joy to hear that on 25 September 2015 the governments of 193 countries, negotiating in the United Nations, approved the Sustainable Development Goals (SDGs), including SDG 15.2, which explicitly states that deforestation must be halted by 2020. This, finally, is a very concrete and crucial target. In 2014, 18 million hectares of forests were lost globally. Forest loss, together with agriculture and land use change, generates 24% of the greenhouse gas emissions that are warming the planet and thought to be aggravating climate phenomena such as El Niño. However, three months later, in the 21st United Nations conference on climate change, the same governments failed to include this key goal in their conference outcome, the ‘Paris Agreement’. Countries with high rates of deforestation, such as Brazil, Indonesia, Myanmar, Nigeria, Tanzania, Paraguay, Argentina and Bolivia, also failed to commit to halt deforestation by 2020 when listing their national contributions to reducing greenhouse gas emissions (Brazil and Bolivia only said that they will halt illegal deforestation by 2020). In fact, in the case of Bolivia, its ‘contribution’ document, which was officially presented to COP 21, implies the deforestation of a further three million hectares of native forests by 2030, which totally violates SDG 15.2 approved just a few months ago. We cannot let the same thing that happened to Lake Poopó, now happen to our forests. 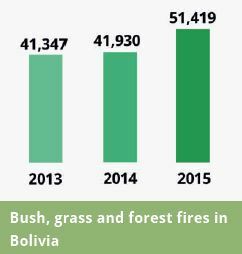 According to Bolivia’s Authority of Supervision and Social Control of Forests and Land (ABT), brush, grass and forest fires in the country increased by 21% in 2015, compared to 2014: there were 41,930 listed in 2014 but this rose to 51,419 in 2015. According to ABT, 46% of these fires occurred in Santa Cruz and 41% in Beni. With respect to causes, ABT claims that 41% of these fires were caused by livestock use, 38% occur in permanent forestry lands, protected areas and forest reserves, and 15% in agricultural areas. We still do not have a report of the total number of hectares deforested in Bolivia during 2015, but there is no doubt that this figure will have increased, since the average deforestation in 2013 was 163,000 hectares with a total of 41,347 fires. Planting trees is very commendable and we all have to get involved in the Bolivian ‘my tree’ campaign, but it is important to note that deforestation in Bolivia is undoing these efforts. According to Bolivia’s Ministry of Environment and Water, one million native seedlings had been planted by the end of 2015 (replanting non-native species would be ecologically destructive, and invasive alien species like Eucalyptus are the second most important cause of global biodiversity loss after land use change). The goal is to plant five million by the end of 2016 covering an area of 7,731 hectares. It all sounds good but actually this is less than 5% of the area of forest destroyed in 2013. Also it must be added that these million seedlings will need to be carefully nurtured for the next 10-20 years if they are to survive and, even when they reach maturity, they will never make up for the exuberant biodiversity lost in the forests that have been destroyed. Bolivia’s emissions reductions proposal indicates that in order to compensate for the deforestation of 3 million hectares, 4.5 million hectares of seedlings will be planted by national efforts alone. It goes on to say that with international cooperation support Bolivia could reforest a total of 6 million hectares by 2030. For the national part of the project, more than 250 million seedlings should be planted each year until 2030 at a total cost of US$ 4,500 million dollars, which is the equivalent of two-thirds of the current external debt of Bolivia. We cannot lie to ourselves. Even if it concerns genuine forest restoration, reforesting 4.5 million hectares by 2030 is not going to happen in Bolivia. The government is just saying that they will reforest 4.5 million hectares to distract us from the fact that the deforestation of 3 million hectares will be catastrophic for the remaining forests, the indigenous communities and different areas that will be exposed to extreme events like floods and droughts as a consequence. It will also be very harmful for climate change globally as it means that around 1,500 million tonnes of carbon dioxide will be released into the atmosphere. It is particularly important to note that even if it did happen, forest restoration is a very slow, time-consuming and expensive process, which cannot simply compensate for deforestation, and cannot immediately compensate for the greenhouse gas emissions lost through deforestation. We have to meet Sustainable Development Goal 15.2 in Bolivia, as elsewhere. Deforestation must stop by 2020. 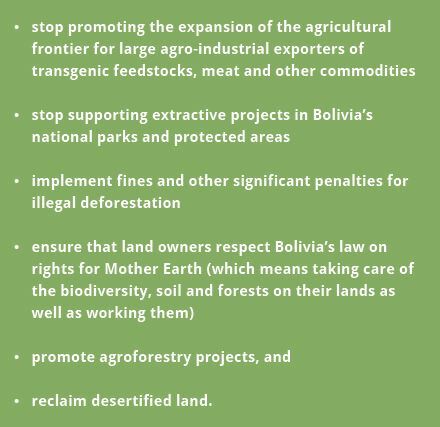 Finally it is important to note that we can guarantee food sovereignty for all Bolivians without losing more forests—but even if we burn all our forests we will never satisfy agribusiness, because it is in the nature of such businesses to pursue profit and growth relentlessly. More land will always be demanded if we continue down this path. Demand for animal products is currently rising rapidly across the world. By 2050, consumption of meat and dairy products is expected to have risen 76 per cent and 65 per cent respectively against a 2005–07 baseline, compared with 40 per cent for cereals. This steady growth in meat consumption cannot occur without having an impact on ecology and on our climate. 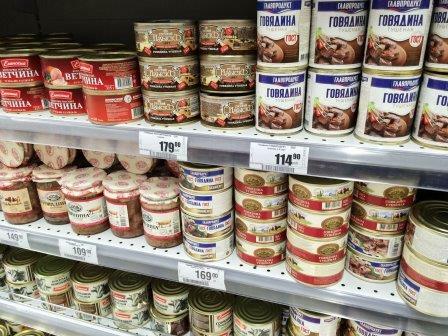 In addition to people in Russia spending more of their income on these products, urbanisation is growing and food consumption patterns are changing. People are eating out more frequently, and purchasing larger quantities of fast and convenience foods, which usually incorporate meat products. This increase in meat consumption might be good for the country in economic terms, if it were not for the dire consequences it is likely to have—both for Russian people and for the ecological situation all over the world. There are well-known concerns about the negative impacts of meat and dairy products on human health (e.g. because of fat and cholesterol, and because industrially produced meats may also contain drugs such as hormones, residues of pesticides and chemicals including fertilisers and PCBs, and parasites and bacteria). But here I would like to draw your attention to another critical issue: the influence of livestock on climate change. Human consumption of meat and dairy products is currently a major driver of climate change. Greenhouse gas (GHG) emissions associated with their production are estimated to account for over 14.5 per cent of the global total. Cattle represent about 65 per cent of the livestock sector’s emissions. In terms of activities the principal sources of emissions are feed production and processing, including land use change (45 per cent of the total from the sector), enteric fermentation from ruminants (39 per cent), and manure storage and processing (10 per cent). Manure and fertilisers used in the production of feed crops are commonly used in Russia. Another link between meat consumption and climate change is increasing demand for high protein animal feeds, which is making Russia ever more dependent on imports of soybeans from other countries where the crop is usually genetically modified (GM). 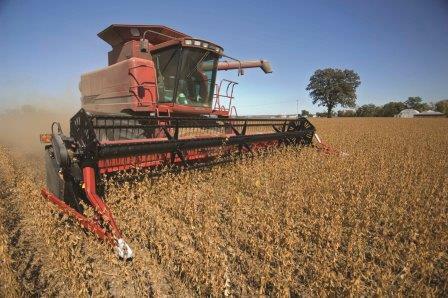 For example, FAOSTAT data shows that Russia imported 1,145,155 tons of soy in 2013. In fact the data shows a dramatic upswing. Between 2000 and 2006 the largest import volume recorded is just 64,000 tons (in 2002). Imports started to climb steeply as of 2007. Russia is now the world’s leading importer of GM soybeans, especially from Latin America, where almost all of the vast fields of crops are genetically modified and treated with one or more chemical pesticides. This has direct implications in terms of climate change. Industrial agriculture is a key driver of climate change. It produces methane, nitrous dioxide and carbon dioxide; and agriculture, forestry and other land use changes are responsible for 24% of total greenhouse gas emissions. 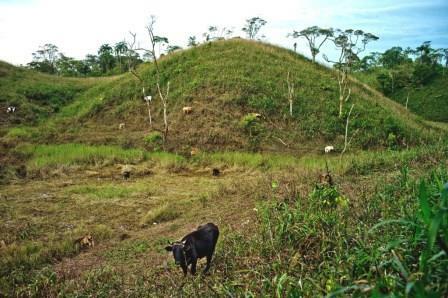 Moreover, in Latin American countries, such as Paraguay, many forests are being cleared in order to establish new cattle ranches or plant GM soybeans. These high deforestation rates contribute to climate change by removing forests, which absorb carbon dioxide from the atmosphere, and by releasing carbon dioxide as well (eg from forest soils). Thus, by supporting the production of animal feed crops, especially GM ones, Russia indirectly contributes to climate change. The problem of reducing emissions from unsustainably produced livestock products was discussed during the COP 21 Climate Conference in Paris in December 2015. On the sidelines of the summit, one American firm proposed an answer in the form of its “Impossible Burger”. Made entirely from plants, it is intended to look and taste identical to beef, and produces a similar smell when grilled. Moreover, a delegation from the Buddhist Tzu Chi Foundation was promoting 11 January 2016 as a ‘Day of Meatlessness’. They think that just one day without meat can help people think about the environmental, ethical, and health issues around meat, and maybe this tendency will grow. A report on the issue of livestock production and its impacts on climate change has been published by members of the Global Forest Coalition. It emphasises the negative influence that the consumption of unsustainable products has on climate change and the urgent need to solve or at least prevent a further escalation of this problem. As for Russia, it should be said that this problem is barely discussed in the media or in government circles. Unfortunately, as in many other countries, the Russian government does not attach much importance to the issue, focusing more (but also not enough) on reducing carbon dioxide output from industry rather than people’s diets. Hopefully, after the 2015 Climate Conference this issue will be given greater importance and Russia will be more active and vigorous on climate change-related issues. In my opinion, interventions to reduce emissions should come primarily from government initiatives, and be based on technologies and practices that improve production efficiency at animal and herd levels. This could include the use of better quality feed (especially non-GMO feed) and feed balancing to lower enteric and manure emissions. The Russian agricultural sector should also reduce fertiliser use and minimise imports of GM feed crops and meat from Latin America. However, these actions alone will not be enough. There also needs to be a change in human behavior towards meat and dairy products. Balancing diet by reducing consumption of meat and dairy products and by eating more pulses, fruit and vegetables is a major step towards the reduction of GHG emissions. This is not a radical vegetarian argument; it is just an argument about eating meat in sensible amounts as part of healthy, balanced diets. This would benefit the climate and would also reduce incidences of meat-related illnesses like heart disease. An improvement in food education is an important step to encourage healthy eating habits and environmental sustainability, and should be considered on individual, social and governmental levels. Livestock–Climate Change’s Forgotten Sector, Global Public Opinion on Meat and Dairy Consumption, Research Paper, Bailey R, Froggatt A, Wellesley L, Energy, Environment and Resources, 2013.